My wife and I were staying at a beach-bungalow resort in Hopkins Village, Belize, which is about halfway down the Belizean coast. Our bungalow was a mere 44 paces from the ocean. We spent our first two days reading novels on beach chairs, napping in hammocks and swimming in the ocean. Now that is a good problem to have. So when we awoke on our third day in Belize we were buzzing with restlessness; with adventure and exploration foremost on our minds. The place where we were staying, Jungle Jeanie’s by the Sea, is a wonderful little collection of raised cabanas spread among the palm trees. It also has a common area which serves as its office and guest dining room. And it has wi-fi. So it’s the place where everyone who’s staying at Jungle Jeanie’s gathers to eat, drink and swap stories about their day’s adventures. On our third morning at Jungle Jeanie’s my wife and I went to the common area for breakfast and there inquired among our fellow vacationers if anyone had any adventures or destinations they’d recommend. An hour later the three of us were standing in Mayflower Bocawina National Park. Mayflower is home to several great trails, all of which wind deliciously through Belize’s thick, green jungles. Some of the trails lead hikers to Maya ruins, and at least four trails lead them to very scenic waterfalls. And then we put on our backpacks and started down the jungle trail (now there’s a happy sentence!). We hadn’t gone more than 20 paces before we came to our first great jungle discovery. A long, long line of leaf-cutter ants bisected our trail, each one carrying a tiny piece of leaf back to their nest. Just a little ways beyond the leafcutters we crossed a bridge spanning Grass Creek (beautiful name) flowing with clear water, and just beyond that we encountered our first Maya ruin, which was little more than an air-raid rubble of bricks, overgrown with trees. We took our last clear look at the sky, then entered the true jungle. The life-living-upon-life-living-upon-life jungle. Tree branches arced over the muddy trail and laced together overhead like the Arch of Sabers at a military wedding. Vines, having climbed up the trunks of trees, now dropped in bandolier loops back to the ground, where they had been overtaken by yet more vines, which had begun to climb them. Moss grew on every log, long and green as Muppet fur. And yet other fallen trees, further along in their decomposition, lay on the ground splayed open along the lines of their growth rings -- very much like the gradations of a topographic map -- with grasses, mosses, flowers and young saplings -- tall and skinny as sunflowers -- growing in the furrows between the split rings. The air, already as humid as Jaguar breath, grew denser still the farther we walked into the jungle. To a man from arid Utah it was like breathing through eight veils of damp, warm cheesecloth, and the pervasive humidity was like wearing three hot, damp sweaters that I couldn’t take off. Chaac, the Maya god of rain, had been very busy in recent days, and the Antelope Trail, already muddy as a blue-slate pig wallow, grew ever muddier and muckier the deeper we plunged into the jungle. The mud had a texture of half-set cement and Vaseline, which sucked at our sandals on every step. Byron, Dana and I walked along the muddy, green trail like three happy, sweaty fleas walking through the part in a Rastafarian’s dreadlocks. We saw surprisingly few flowers or blossoms as we happily walked along, but it was obvious to our olfactory senses that there were thousands more in near proximity hidden behind the screen of foliage that obscured our vision. If you’ve ever worked in the Bishop’s Storehouse on the day when they dismantle the beehives and extract the honey, with that almost nauseating, too-sweet, honey smell saturating the room, well, the entire jungle smelled just like that. But this was only the pervasive middle note. 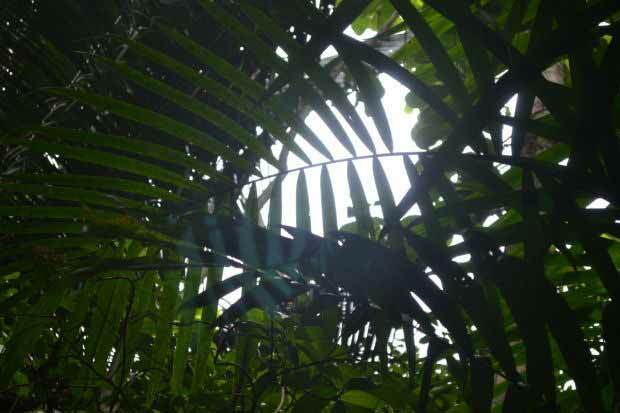 The jungle also gave off a thin, nearly transparent top-note of recent rain. And beneath that a delicate base note of jungle mud. I found it all absolutely fascinating! Ya gotta love jungle trails! And then we came to the stairs. 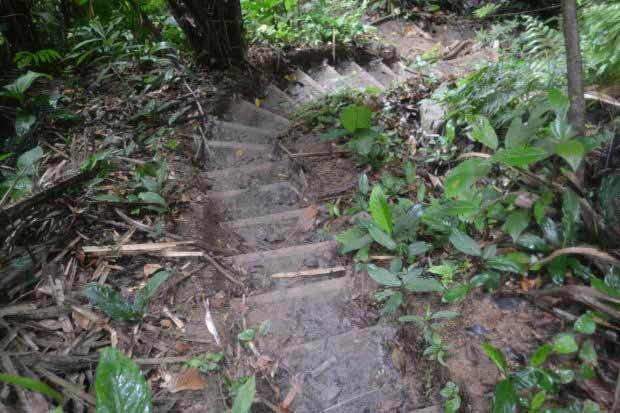 At first it was just a few of them; about 20 stairs set down in a steep section of trail. We reached the top of the stairs and found that the trail continued its slow, meandering climb. But we didn’t go far before we reached more stairs. At first there was more trail than stairs, but after another 10 minutes of walking there was more stairs than trail. Another 10 minutes of walking and it was almost all stairs. But don’t picture solid stone stairs. These were stairs of very simple construction: a square of the dirt trail had been leveled and fronted with a square of wood to hold the dirt in place. But now, after a couple days of rain, the stairs were just little boxes of mud. We quit calling the trail by its true name, Antelope Trail, and started calling it Muddy Machu Pichu. Butterflies flitted by. Caterpillars crawled up trees. Leaf-cutter ants paraded their green banners across the trail. Other insects, embedded in the jungle foliage, clicked like Fukushima-Daiichi Geiger counters. And yet other insects made a pulsing, continuous, needle-at-the-end-of-the-LP, white-noise scratching. As we continued our upward climb, the trail shifted away from the deep jungle interior over to the side of the mountain, and here and there, through gaps in the foliage, we could look out across the jungle lowlands, and across the first few hills. But the air that day was so damp, so dense with haze that we couldn’t see very far. In the jungle, even the air is thick. But after less than three seconds the Geiger-counter bugs and the LP-white-noise insects started up their pulsing scratching again. The birds resumed hooting, and the frogs again bellowed their hroort-hroot-hroorches. I couldn’t help but wonder if there is a name for this phenomenon. What the heck can make every creature in the jungle, every insect, mammal, bird and reptile go silent all at once? And then the deeper, more important question: What has happened to humans that we’re no longer in tune with that vibrational energy? It was something I continued to ponder as we resumed our climb. Five minutes later we passed four people who were on their way back down. “You’re almost there!” they tell us brightly. Oh my! Was it ever! We reached the pool just a few minutes later. It could not have been lovelier! It was about half the size of a basketball court and filled with cool, clear water which tumbled down a waterfall in the rear of the pool, and emptied by a waterfall spilling out its front. It was surrounded and shaded by tall, tall palm trees. Byron, Dana and I had the place to ourselves. We took off our shoes and excess clothes and waded in. After 90 minutes of hiking up a steep mountain, through jungle humidity it was like slipping between the cool sheets of basement bed. Byron found a rope dangling down the waterfall at the rear of the pool. He used it to help him climb up to a rock ledge about 10 feet above the pool, and cannonballed in. I then did the same. Then the three of just swam and splashed about, enjoying the refreshing water. After Byron had swum his fill, he announced -- probably feeling like the third wheel -- that he was going to start back. Dana and I swam to the back of the pool and let the jungle waterfall splash over us. Then we just floated on our backs and held hands as we drifted around the pool. Five or six palm trees leaned over the pool holding the little circle of smoky-blue sky like the prongs of a ring holding a jewel. The sun lit up the palm trees’ yellow-green leaves like stained glass. Spontaneity is one of the few virtues that I possess. And my spontaneous adventures have garnered me some of my greatest treasures in the form of memorable adventures and magical moments. I carry these memories like loose jewels in a pouch; but I keep them close to my heart. And today’s spontaneous adventure has given me yet another flawless gem. This time in an absolutely perfect setting. 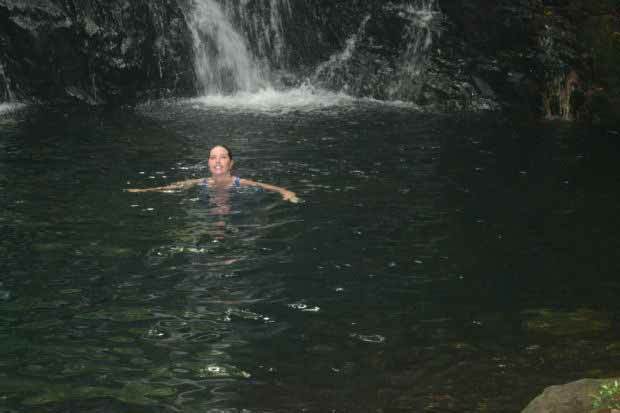 Dana Law swimming in a waterfall pool at the top of Maya paradise. 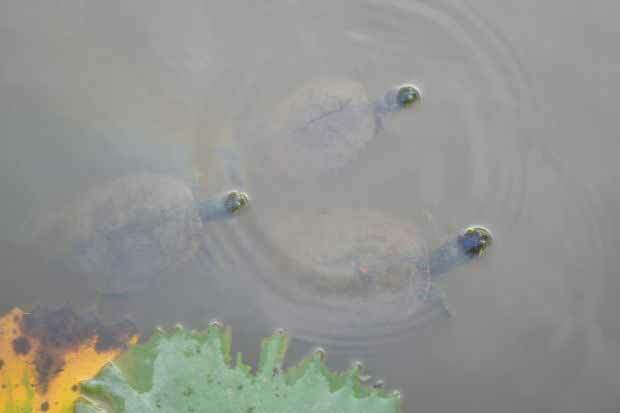 Three turtles swim in this Belizean pond. The stairs on the Antelope Trail are steep and endless. Leaves shine like stained glass. 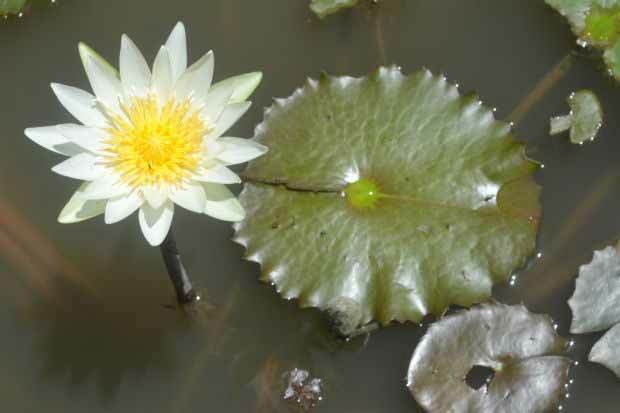 Flower and lilypad in a jungle pond. 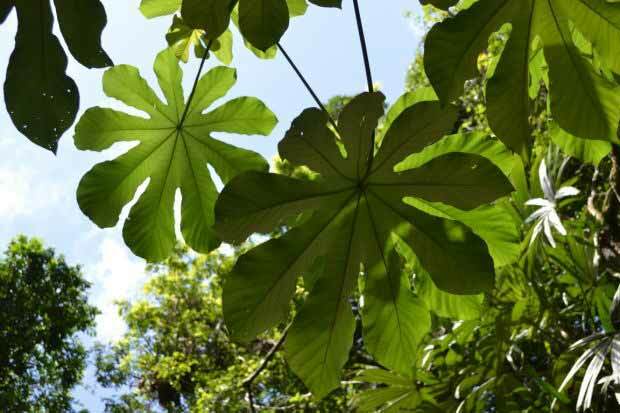 Palm leaves form skylights in the canopy of the jungle in Belize. 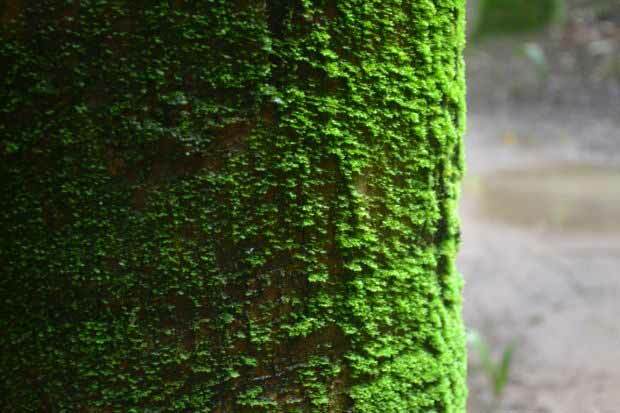 Moss grows on a palm tree in the jungle of Belize.